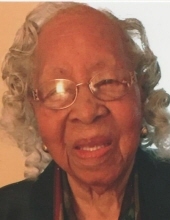 Mrs. Cecil G. "Aunt Cecil" Burnett , 108 passed away on Thursday January 10, 2019. She was a member of Guiding Star Baptist Church. Mrs. Burnett is survived by her nieces, Rhonda Page Shavers (David), Carolyn Bond and nephews, George Page, DaRon Shavers, JWann Gartin and a host of other relative and friends. Her visitation will be held on Thursday at 10:0AM followed by the service at 12:00 Noon, both will be held at her church, 2724 W. Muhammad Ali Blvd., Interment: Louisville Cemetery. Hathaway & Clark Funeral Home, Inc., in charge of arrangements. To send flowers or a remembrance gift to the family of Cecil G. Burnett, please visit our Tribute Store. "Email Address" would like to share the life celebration of Cecil G. Burnett. Click on the "link" to go to share a favorite memory or leave a condolence message for the family.